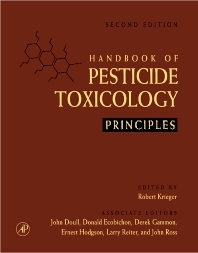 This revision of the highly acclaimed Hayes' Handbook of Pesticide Toxicology is an in-depth, scientific sourcebook concerning use, properties, effects, and regulation of pesticides. This edition is a comprehensive examination by international experts from academia, government research, and the private sector of critical issues related to the need, use, and nature of chemicals used in modern pest management. This two-volume set contains up-to-date information on a broad range of topics which establishes context of pesticide use and outlines how they are scientifically evaluated. Experts from a variety of disciplines contribute to this work. Some provide a fresh look at existing information, and others look ahead at issues that are central to understanding pesticide use and toxicology in modern integrated pest management. Dose (Dosage and Other Factors Influencing Toxicity. Pest Control Agents from Natural Products. Lawn and Turf: Management and Environmental Issues of Turfgrass Pesticides. Insecticides and Their Use in Urban Structural Pest Control. Verterbrate Pest Control Chemicals and Their Use in Urban and Rural Envrionments. Pesticide Use in Veterinary Medicine. Pesticide Use Practices in Integrated Pest Management. Regulatory Evaluation of the Skin Effects of Pesticides. Ecotoxicological Risk Assessment of Pesticides in the Environment. Developmental and Reproductive Toxicology of Pesticides. Worker Exposure: Methods and Techniques. Residential Exposure Assessment: An Overview. Modeling Dietary Exposure with Special Secitons on Meodeling Aggregate and Cumulative Exposure. Greenhouse and Mushroom House Exposure Coping with Aggregate Pesticide Exposure Assessment: An Integration Approach. Occupational Exposure Data Bases/Models for Pesticides. Factors that Affect Pesticide Metabolism and Toxicity. Diagnosis and Treatment of Poisoning Due to Pesticides. Surveillance of Pesticide-Related Illness and Injury in Humans. Hydrophobicity as a Key Physicochemical Parameter of Environmental Toxociology of Pesticides. Modern Approaches to Analysis of Pesticide Residues in Foods and the Environment. Risk Assessment and Risk Management: The Regulatory Process. Risk Assessment for Acute Exposure to Pesticides. Risk Assessment for Chronic Exposure to Pesticides: The Triazine Herbicide Cyanazine. Pesticide Residues in Food and Cancer Risk: A Critical Analysis. Perceptions of Pesticides as Risks to Human Health. Mammalian Toxicity of Microbial Pest Control Agents. The Influence of Age on Pesticide Toxicity. Emerging Issues: Children's Exposure to Pesticides in Residential Settings . Pesticide Percutaneous Absorption and Decontamination. The Metabolism of Organophosphorus Insecticides. Understanding the Toxic Actions of Organophosphates. Aldicarb: Current Science-Based Approaches in Risk Assessment. Interactions with the gamma-Aminobytyric Acid A-Receptor Polychlorocycloalkanes and Recent Congeners. The Avermectins: Insecticidal and Antiparasitic Agents. Inhibitors and Uncouplers of Mitochondrial Oxidative Phosphorylation. Pyrethroid Insecticides: Mechanisms of Toxicity, Systemic Poisoning Syndromes, Parathesia, and Therapy. Boric Acid and Inorganic Borate Pesticides. The Safety Assessment of Piperonyl Butoxide. Symmetrical and Asymmetrical Triazine Herbicides. Inhibitors of Aromatic Acid Biosynthesis. A Toxicological Assessment of Sulfur as a Pesticide. University of California, Riverside, U.S.A.